The Duke and Duchess of Sussex have arrived in Dublin for their first royal engagement overseas as a married couple. Britain's Prince Harry and Meghan Markle met Taoiseach Leo Varadkar at Government Buildings this evening. They are also due to meet President Michael D Higgins during a visit lasting around 24 hours. Housing, homelessness and the Invictus Games were among the topics discussed by the Taoiseach and the royal couple during their meeting. A spokesperson for the Taoiseach said Prince Harry asked about some of the issues facing Ireland in terms of homelessness and housing. He also mentioned that his father had told him how much he enjoys visiting Ireland, and both the Duke and Duchess asked about Ireland's tech industry, with the Duchess expressing her particular interest in encouraging women to take up STEM subjects. Sport was also on the agenda as the three discussed rugby, as well as England's forthcoming World Cup match and whether Ireland's Defence Forces could participate in the Invictus Games in the future. The Duke is the founder of the Games in which wounded former servicemen and women participate, and the games include countries that have a role in peacekeeping. 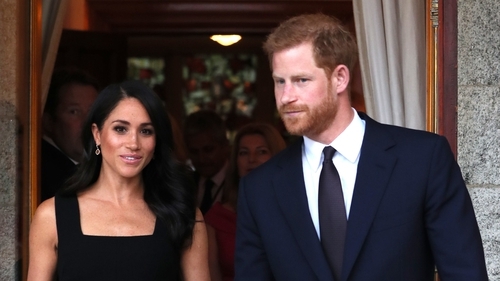 The three also spoke about NWU Chicago, where the Duchess studied and the Taoiseach's partner, Dr Matt Barrett works at the university hospital, as well as Trinity College, where the Duchess is an honorary member of the Philosophical Society. The pair then travelled to the British ambassador's residence at Glencairn in south Dublin for a summer garden party. The Duke spoke of common values between the two countries and remembered the visits made here by his father Prince Charles and his grandmother, Queen Elizabeth II. He said: "As each other's closest neighbours, the UK and Ireland's relationship is unique; our shared history is long and complex. There have of course been challenging, and at times tragic, periods of that relationship. "This is a very special relationship between two proud, sovereign countries. We share common values; culture, business links, family ties, and possibly a similar sense of humour. "Our relationship is of course informed by our history, but it is also one which is now dynamic and forward looking." Amongst the 300 guests in attendance are Brian O'Driscoll and Amy Huberman, Olympic sailor Annalise Murphy, jockey Ruby Walsh, designers Emma Manley and Helen Steele and director Nora Twomey. Also in attendance is Vicky Phelan, one of the women affected by the cervical cancer controversy. The Limerick woman said she was "gobsmacked" when the Duchess told her she had heard of her story. Speaking after meeting the Duchess Ms Phelan said: "She said: ‘I have been following your story; you have been doing some great stuff’." Tánaiste Simon Coveney, Ministers Charlie Flanagan, Simon Harris and Josepha Madigan along with Sinn Féin leader Mary Lou McDonald and the leaders of the Green and Labour parties, Eamon Ryan and Brendan Howlin, also attended. On the itinerary tomorrow is a visit to Croke Park and the Book of Kells at Trinity College Dublin, as well as the Famine Memorial at Custom House Quay and EPIC - the Irish Emigration Museum. There will also be an opportunity to view an example of the new Ireland, with a visit to the start up hub DogPatch and a meeting with young people taking part in coding workshops. It is expected the visit will conclude late tomorrow afternoon.